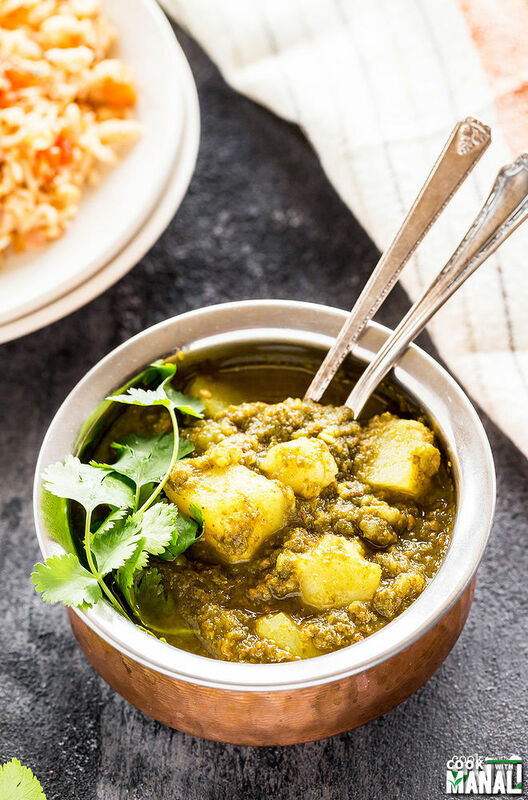 Instant Pot Aloo Saag – a spinach and potato curry made in the instant pot. Vegan, paleo & gluten-free. Happy Thursday guys! Hope you all are having a wonderful week so far. I wanted you guys to know that I will be updating my blog only twice a week from now on. As you guys know, a lot has been going on in my personal life. I have been super busy making trips to India almost every month due to my mom’s health and so I have not been able to give my blog the time & focus that it deserves. Updating thrice a week was becoming increasingly difficult with all the craziness so I have decided to cut it down to 2 and I just wanted you all to know this. Of course I might come back to 3 recipes per week again if things settle down but for now 2 it is. And now moving on to food and today’s recipe. Instant Pot seems to be the latest craze in the food world. Everyone is using it to whip up quick and easy meals in no time and since I am a food blogger, I had to jump on the bandwagon too. Actually my dad gifted me Instant Pot on daughter’s day last year in October however I did not start using it until recently. Back then, I had been meaning to buy a slow cooker and I told this to my dad who was here around that time. So once he went back to India, he did some research and ordered this Instant Pot for me since he thought this had the slow cooker option plus so much more! Aren’t dads the sweetest? I think he made a smart decision because this kitchen gadget is really cool, saves you time and there’s so much you can do with it. As an Indian, we use pressure cooker in our kitchen everyday. Ever since I have started using Instant pot, I have not used my regular pressure cooker in stead I just use the pressure cook option on my instant pot. The good thing is that it doesn’t whistle like a regular pressure cooker and that’s a huge plus in my books! Plus you can steam veggies, slow cook and so much more. 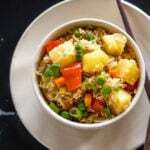 Because Instant Pot is so awesome, I have decided to start a blog series featuring Vegetarian & Vegan Instant Pot recipes starting today. Of course there will lots of Indian recipes but I will be sharing pretty much everything. Excited? I know I am! Let me know what you guys think about this series. 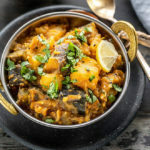 So the 1st recipe for this series is Instant Pot Aloo Saag which is a potato and spinach curry. 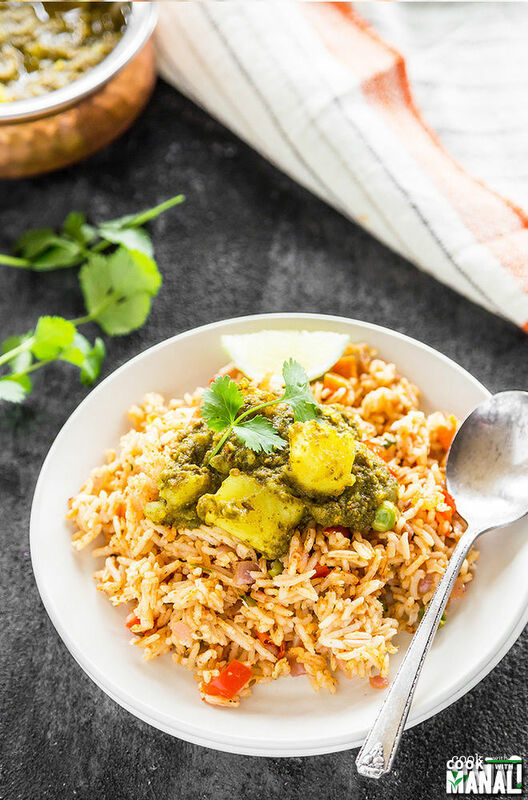 It’s vegan and gluten-free and all made in the Instant Pot! You only need to do 2 things prior to making this dish – puree the tomatoes with some ginger and green chili and puree the spinach with water. Once that’s done, it’s all cooked in the pot, first on the saute mode and then manual pressure setting. I pressure cooked this on high for 8 minute and the potatoes turned out a bit overcooked/mushy for my taste though my husband loved the soft potatoes so it’s really a personal preference. Go for 8 minutes if you don’t mind overcooked potatoes and if you do, then reduce the pressure cook time to 6 minutes. 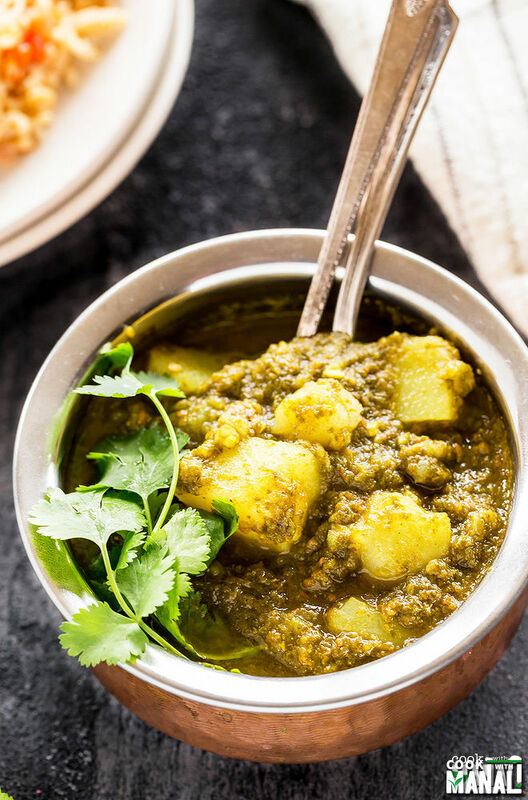 Here’s how you make aloo saag with step by step instructions. I will be looking forward to feedback on this series. If you guys like it enough, I will also starts doing videos for these instant pot recipes. So please let me know! To your food processor/blender add the spinach leaves along with little water to make a puree. Puree spinach along with water. Set aside. Next puree tomatoes with ginger and green chili. Set aside. Press saute mode on IP and add oil. Once the oil is hot, add cumin seeds and let it crackle. Add copped garlic, saute till it starts turning golden in color. Then add chopped onions, saute for 2 minutes till it starts changing color. Add the pureed tomatoes, stir, cover the pot slightly and cook for 3 minutes. 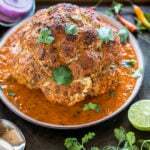 Remove cover, add salt, coriander powder, garam masala, turmeric powder and cumin powder. Stir, cover slightly and cook for another 2 mins. Add pureed spinach and stir. Cover and cook for 2 more minutes. This is how I covered the IP, don’t seal it just keep the cover on top of the pot. Remove cover and add cubed potatoes and stir. At this point add water if you want a more watery curry. I added little water here. Cancel saute mode. Press manual more and select high pressure for 6-8 minutes. 8 minutes will result in overcooked potatoes, if you want your potatoes to be bit firm, go for 6 minutes. Vent should be in sealing position. Once pressure comes off, open the pot and give a stir. Add fresh lemon or lime juice. 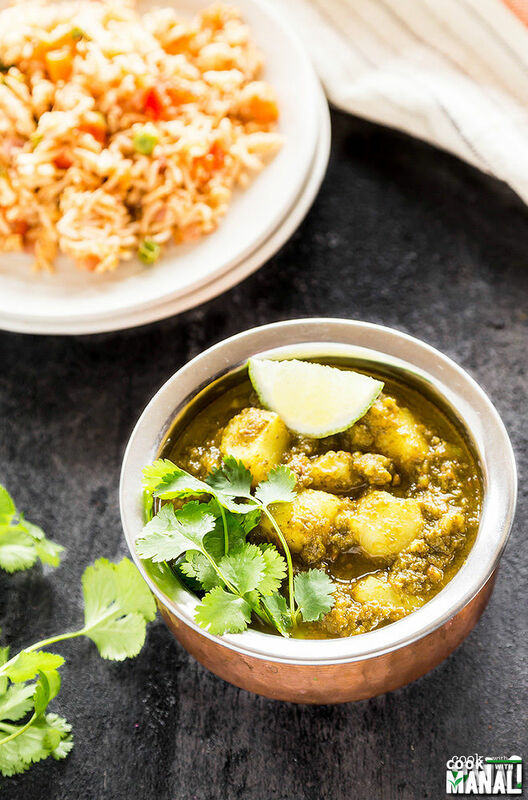 Serve aloo saag with rice or any bread of your choice. It tastes great with boiled rice. * Adjust spice levels to taste. Add more green chili or some red chili powder for a spicier curry. * Add water as per your preference. You make keep the curry semi-dry but not adding any water. Since I was eating this with plain rice, I added water to get a nice curry. 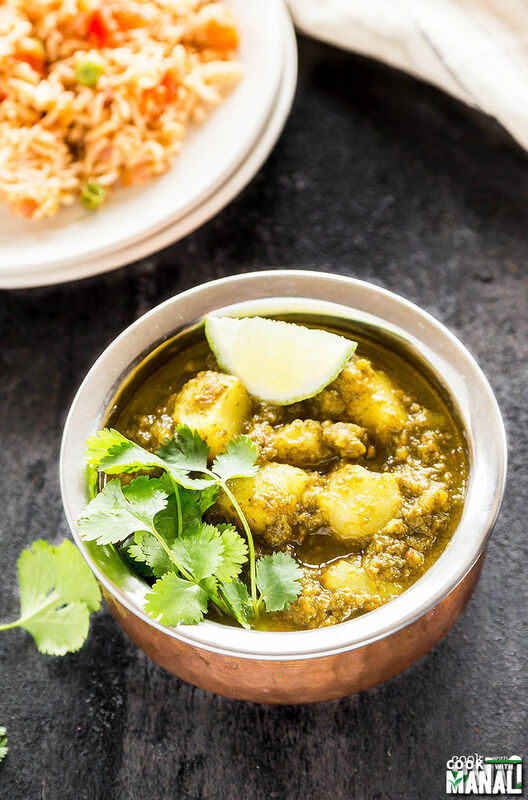 Vegan Spinach Potato Curry made in the instant pot! Press saute mode on IP and add oil. Once the oil is hot, add cumin seeds and let it crackle. 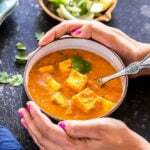 Remove cover, add salt, coriander powder, garam masala, turmeric powder and cumin powder. Stir, cover and cook for another 2 mins. Cover and cook for 2 more minutes. This is how I covered the IP, don't seal it just keep the cover on top of the pot. 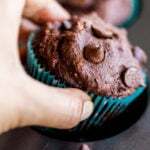 That looks so delicious! I am surprised that you can still update the blog twice a week with so much going on at home. 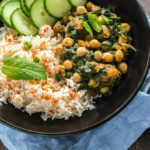 I love that this meal uses an instant pot! Looks SO cozy and perfect for these last chilly days of winter! 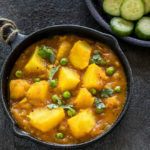 please make videos too for instant pot recipes.. ours is an indian family n we too brought similar instant pot , but i find indian instant pot recipes are so hard to find.. especially coz the cook time is so critical as i found out the hard way wen wrong timer setting turned daal into curry, so i fear doing guess work.. wud definitely luv to see more instant pot recipes ..!! and by the way i feel so proud of you and ur work..!! lots of gud luck and keep up the hard work.. will definitely pray for ur mom’s speedy recovery..! Thank you Nirmal, I appreciate the good wishes 🙂 and will definitely post more instant pot recipes! Please make more Instant Pot videos! I am about to buy this for us and want to know what else we can make. Could you go over some of the features, like when to use low or high pressure, making yogurt, how long the warm feature works, and how hard is it to clean this thing?? I will try to do a post on those lines Jessica! 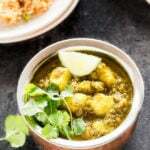 Saag looks so delicious and comfy, Manali. Wow, your curry looks so endearing! For a lack of a better word lol. It look great, and I’m sure it tastes great also. What a pretty dish, Manali! I’ve been contemplating getting an instant pot for a while now, so I think I might give in soon. This curry is so colorful and I love the flavor! This dish looks incredible ! I need to use my instant pot more often. Pinned! Made this for my family last night. Soooooo tasty. Everyone said it was like eating at a restaurant. Thanks a bunch! Do you do a Quick Release or Natural Release when the pressure cycle is done? you can do either, I did a natural release.. Kept getting the burn message. The pot doesn’t want to get up to pressure with this recipe. I have deglazed 3 times and added extra water each time. Switching to slow cook mode to save the meal. Hope it turns out well. Hi Lori, I am not sure what went wrong. This recipe has substantial amount of liquid and you shouldn’t get the burn message. I have been hearing about issues with the newer models …if you keep getting burn at everything, maybe you should contact the IP support..one of my readers had the same issue and they exchanged her IP for a new one. This is great. Thank you! I am not Indian, but have been cooking Indian food since my teens. Just made this in the instant pot, using chard from the garden because no spinach. Needed to add a *lot* more 🌶. 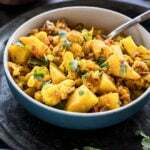 Do you have a good recipe for mango pickle?